BOCA RATON, Fla. - April 5, 2013 - PRLog -- Henry Ford's industrial innovations were directly responsible for the transformation of the United States into the most productive, affluent, and powerful nation on Earth. My Life and Work describes exactly how Ford did this in terms of not only manufacturing science, but also economics and organizational behavior. This holistic approach, and its validation by world-class results, make Ford's original work the best business leadership book ever written. 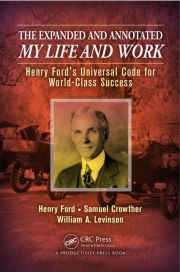 The Expanded and Annotated My Life and Work: Henry Ford's Universal Code for World-Class Success updates this original with modern perspectives that explain and organize Ford’s thought process explicitly. My Life and Work is not a mechanistic or industry-specific formula that practitioners can follow like work instructions in a factory, but rather a holistic synergy of impartial laws of economics, science, and human behavior—a synergy that Ford called the universal code. This universal code simultaneously delivered high profits, high wages, and low prices in every industry to which Ford applied it. It also realized unprecedented improvements in industries ranging from coal mines to railroads, and even healthcare as practiced in the Henry and Clara Ford Hospital. This annotated edition introduces Ford’s universal code along with vital economic, behavioral, Lean manufacturing, and customer service principles. It contains almost all the material of the original, plus more than 30 percent new content that reinforces Ford’s timeless principles. Readers who understand and internalize Ford’s universal code can easily overcome the self-limiting paradigms that afflict today’s organizations. These include, for example, the belief that healthcare is a zero-sum game in which escalating costs are the price of quality. The book illustrates the basic elements of what is now called the Toyota Production System as well as the organizational and human relations principles needed to gain buy-in and engagement from all participants.